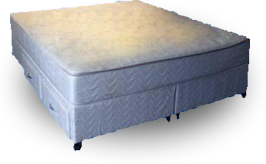 We can supply The DELTA SLEEP Soft-sided waterbeds with or without Drawers , They are upholstered in a Cream Quilted Fabric with a removeable washable Wooltop or a luxurious quilted pillowtop. 1. Zip-off 100% pure wool cover for easy cleaning. 3. Woven fabric sleeves bonded to foam wedge. 5. Nylon/Vinyl reinforced base sheet. 6. Reinforced sheet sewn to fabric sleeves. 7. Heavy duty special formulated PVC Flotation mattress. Every Delta Sleep soft sided flotation sleep system is engineered for strength. This construction comprises a nylon and vinyl reinforced sheet which has woven fabric sleeves sewn into its outer perimeter. These fabric sleeves are then bonded around the high density foam wedge to provide the strongest foam cavity available and eliminate any side to side flex. The result is the ultimate in strength, durability and comfort.